This type of cold storage construction is our main business activity and it is what we built our company’s reputation around. We have several insulated panel sizes in stock in order to build some of the largest freezer rooms and freezer warehouses for commercial and industrial use. In addition, we provide installation of mechanical refrigeration and ensure the implementation and optimal performance of all components. Several door models are available to configure your freezer room construction plans. Freezer room doors installed by Frigo l’Entrepôt offer a perfect look and an irreproachable quality mechanism. The hinges, the door handle and all of the door accessories are top quality and long lasting. Also available; simple or double, with or without motors. Sizes are adapted following the height and the width. 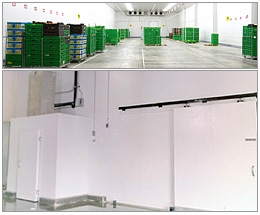 This type of door is perfect for shipping and receiving area in freezer warehouses that use forklifts.